Pumpkin bread is one of those foods that I believe can be enjoyed all year round but tastes especially good in the fall. Don’t you agree?! 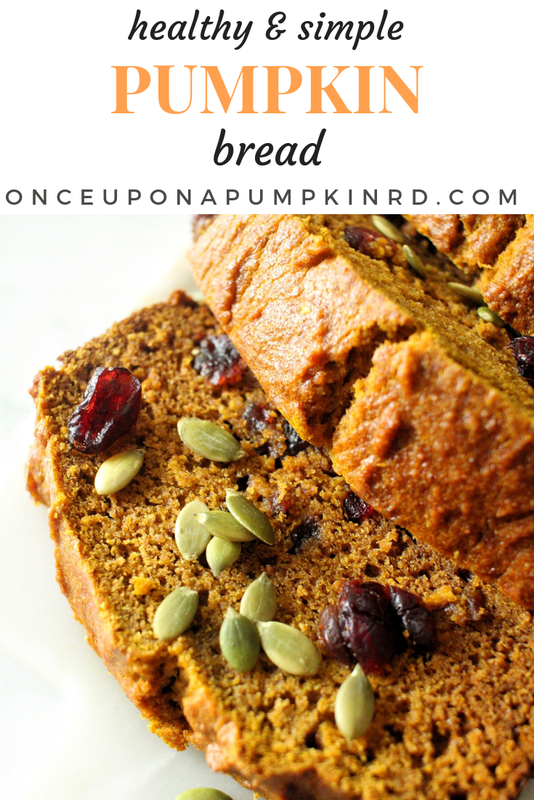 This recipe for healthy pumpkin bread will wow you with how simple is it to make and how much you will want to make it over and over again. 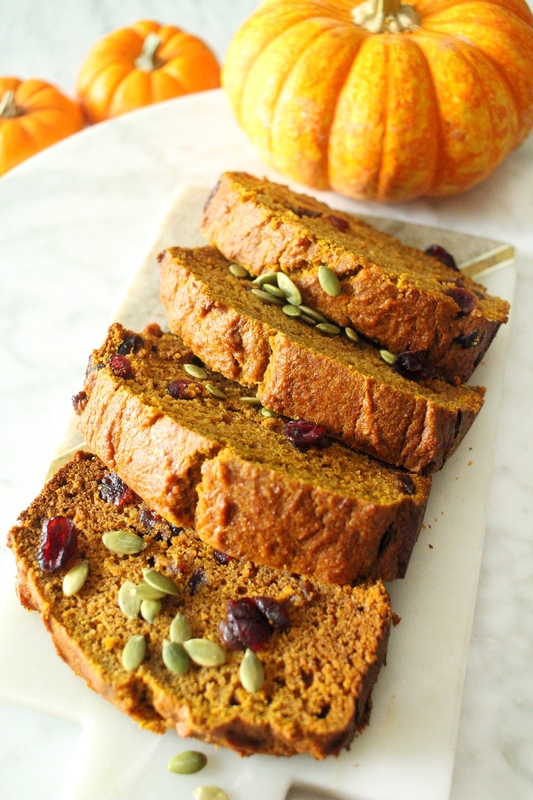 This healthy pumpkin bread is like a blank canvas for you to add it whatever toppings you would like. It’s one to have in your arsenal as something to bring to tailgating, a holiday party or a girls weekend in the fall. Here I added dried cranberries and topped it with pumpkin seeds which I think is so quintessential fall. Chocolate chips and nuts would be great too! Although I agree the pumpkin bread from Starbuck’s is delicious, it’s definitely not the best in terms of nutrition. I treat that one as a special treat when I’m at the airport and instead opt for this recipe for healthy pumpkin bread when I’m making it throughout the fall. Pumpkin puree itself contains lots of unique vitamins and minerals which does make pumpkin bread a sensible addition to your fall diet as long as it’s not packed with sugar! The beauty of this recipe too is that it can be made in one bowl with no fancy mixer required. It’s great to whip up during a cozy fall weekend or when you’re craving the taste of fall but want a sensible treat. Whole wheat flour includes the bran, endosperm, and germ of the wheat grain which gives it a darker color and makes it more nutritious. If you’re itching for more ways to use pumpkin be sure to check out 50 ways to use pumpkin puree you never thought of and my first cookbook, the Once Upon a Pumpkin Cookbook, featuring 50 creative pumpkin recipes that are sure to please any pumpkin lover! There’s even paleo, gluten free, dairy free and low carb recipes. These gluten and dairy free pumpkin cookies are also one of my favorites to make in the fall and just like this recipe, something I could make over and over again. 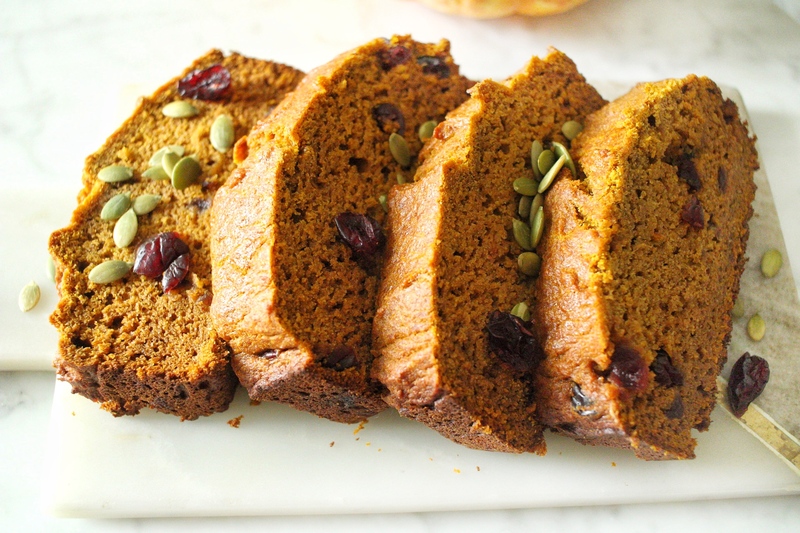 Get into the spirit of the season with this healthy and simple pumpkin bread. Made with minimal ingredients and maximum pumpkin spice, it’s sure to be a recipe you make all year long when a craving for pumpkin hits! Make it your own by adding different toppings into the batter or keep it plain and top with nut butter while the pieces are still warm. Preheat oven to 325 degrees F and grease a 9×5-inch loaf pan. In a large bowl, whisk the oil and maple syrup together together. Add the eggs and whisk until blended. Add the pumpkin purée, milk, pumpkin spice, baking soda, vanilla and salt, and whisk to combine. Use a big spoon to stir in the flour until just combined. If adding any mix-ins, gently fold them in now. Pour the batter into your greased loaf pan and bake for 55-60 minutes or until a toothpick inserted into the center comes out clean. Transfer bread to a cooling rack and let cool before slicing. Bread is best kept in the refrigerator (heat up a slice when you want!). *You could use honey in place of maple syrup here, but I prefer the taste when I use maple syrup! 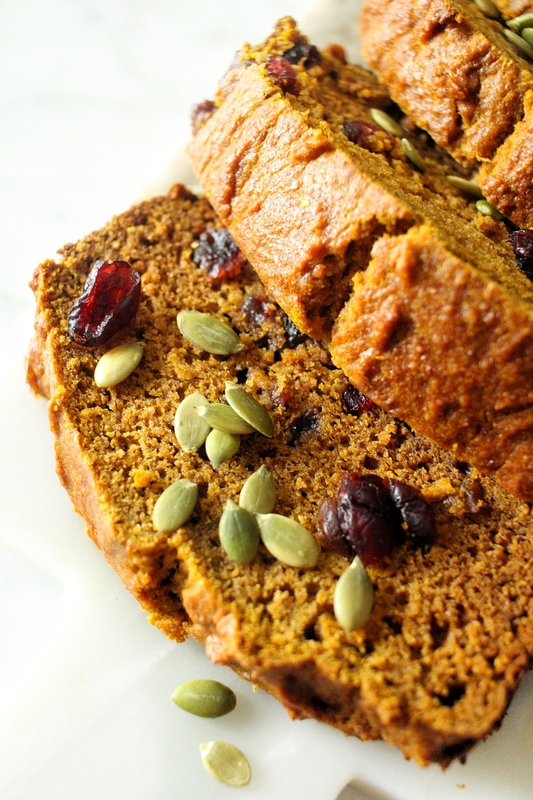 Pin this healthy pumpkin bread recipe for later!